We’re almost through Shark Week, and if you are not sipping on some themed cocktails yet- We have a bunch for you to try! Grab some friends, the remote, and a bottle of Clique Vodka this weekend, and get into Shark Week! The main ingredient in this delightfully gory cocktail is what I like to call “Chum,” which is basically a sloppy strawberry infusion that comes out looking like, well a shark attack just took place. To make the “Chum” cut the tops off of 2 lbs of ripe strawberries, and cut them all in half. Place a funnel in an empty Clique Vodka bottle, and force the strawberries through into the bottle, squishing them to a pulp in the process. Fill the bottle with Clique Vodka, and give it a really good shake. Let your infusion sit in a warm place for 1-3 days, until the strawberries have given all their color to the vodka. 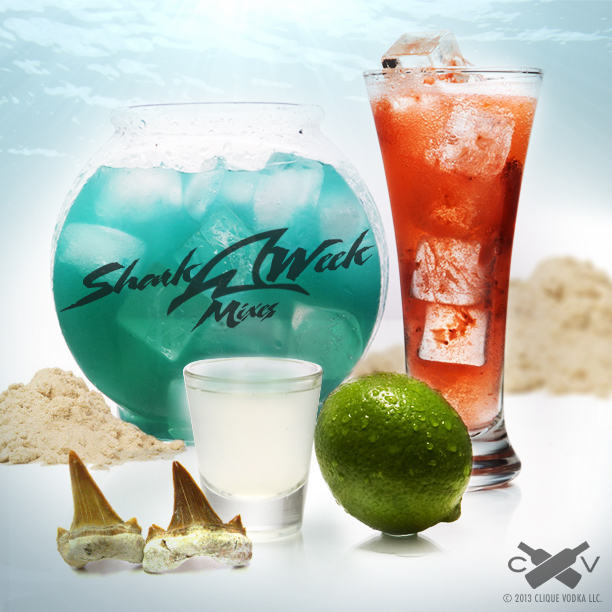 For the actual “Shark Attack” cocktail, just pour out 1 1/2 oz of “Chum” into a tall glass with ice and top with lemon lime soda. This tasty little shot is easy to make, and packs quite the punch. In a cocktail tin with ice shake: 3/4 oz Clique Vodka, 1/4 oz triple sec, and 1/4 oz lime juice until frosty, then strain into a shooter glass. As always- you can double or triple the recipe to make rounds of shots at once! Any shark tank is a dangerous place to be, and this recipe is no different- play it safe and make sure you have a drinking buddy to help you with this gargantuan cocktail. Pack a small, clean fishbowl past the brim with ice, and slowly add 2 oz Clique Vodka, 1 oz Clique Vodka Orange Liqueur*, 3 oz pineapple juice, and 1/4 oz blue curacao. 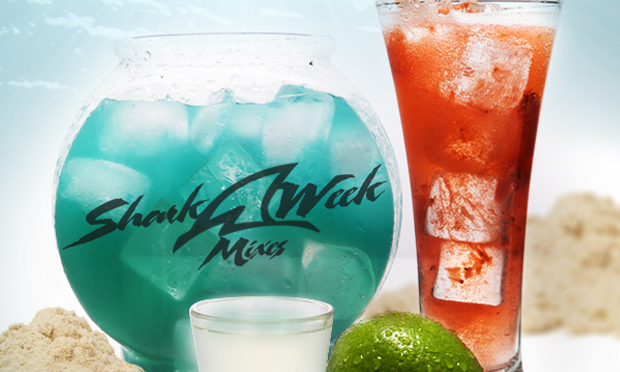 * Stir with as many straws as it takes, and if you can find some, throw a few gummy sharks in there for good measure. (*Click here for instructions on how to make your own Clique Vodka Orange Liqueur, and blue curacao).